China for me has always been Hunan. The beautiful campus of Hunan University at the foot of the Yuelu Mountain with its famous Yuelu Academy. The rice terraces and the peasant life in Xiangtan County. Stinky tofu on the streets and red hot chili peppers in every meal. The Yueyang Pagoda with the backdrop of Dongting Lake. 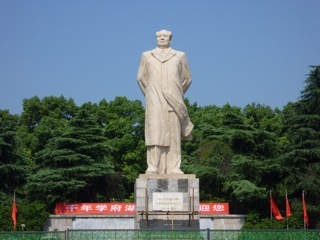 And the red earth house in Shaoshan, where Chairman Mao was born. So we go, two Germans and one Chinese with a German passport. We get the first flavor of modern Chinese mass tourism upon our arrival. The brand new train station of Zhangjiajie town looks like an airport terminal, and Asia’s longest cable car (7000 meters) is already visible from here. After a 30 minute cab ride, we arrive at our hotel in Wulingyuan. The village is close to the main entrance gate into the National Park, and it is so packed with tour buses and honking cars that it is a challenge to cross the street. Our first stop is the travel agency – we are here for hiking and we don’t want to waste time. The young woman at the agency suggests a route: “We can go up by cable car to visit the sites in the Eastern part. 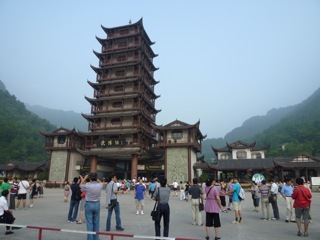 After lunch, the environmentally friendly bus will take us to the Western side, and in the evening, we take the elevator back down.” Indeed, Zhangjiajie, as far as I know, is the only place in the world where they have built an elevator into the mountains. We explain that we would like to hike up to the top. The travel agent shakes her head: “No, that is very strenuous and very dangerous.” She would not recommend it. We argue with her for half an hour and then we ask her to find a local peasant to be our guide. The first person she calls doesn’t want to be responsible for three crazy foreigners. The next guide agrees to take us on. Mr. Peng meets us at the big gate. He wears orange plastic sandals and a straw hat. We pay 247 Yuan per person for a two-day pass and get in line at the entrance where they take our fingerprints. We start hiking on a well built stone path in the forest and continue on the typical stairs, which the Chinese hew into all their mountains. I notice that Mr. Peng walks them up in zigzag – it is better for the knees. The forest is lovely and everything is peaceful for an hour, before we meet the first people coming downhill. “Look, foreigners,” they comment. “And they are hiking uphill!” After a few more turns, we have caught up with the masses at the first viewpoint. Cameras are clicking, people are shoving and pushing and tour guides are shouting into megaphones. Vendors sell little wooden carvings, stitched bags and purses, jade bracelets, postcards, hats and hiking sticks. And wherever there are Chinese tourists, there has to be greasy food on sticks: deep-fried tofu, sausages, whole quails and fish. In Zhangjiajie, they also sell local cucumbers as refreshment. It is not quite what we had hoped for. But my friend’s sister was right: The mountains are still here, and they are spectacular! We accept the fact that there won’t be much hiking, pull out our cameras and start clicking away. We let Mr. Peng explain the rock shapes: a “Fairy with a flower pot”, a “Heavenly Chair” or “Zhubajie carries the old lady” (Zhubajie is a character in the novel “Journey to the West”). Then, without much protest, we get on the “environmental bus” (which runs on a diesel engine) to get to the other side of the mountain range. This area claims to be the place, which had inspired the production team of Avatar, last year’s 3-D box office hit by James Cameron. We see the mountain which looks as if it is floating, at least if clouds cover its bottom half. Cameron’s producers had visited the area, but when the director himself came to China to promote his movie, he mistakenly referred to the internationally much more famous Yellow Mountain as his model. 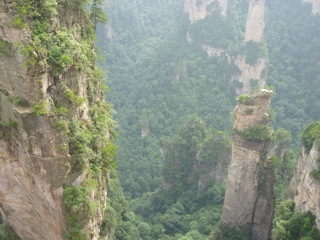 The resort management of Zhangjiajie created a crisis task force and launched a desperate ceremony in which they renamed the rock which was previously known as Southern Sky Column into “Avatar Hallelujah Mountain”. As we take the glass elevator down and listen to the announcements in Chinese and Korean, I have my doubts whether better marketing would have attracted more international tourists. 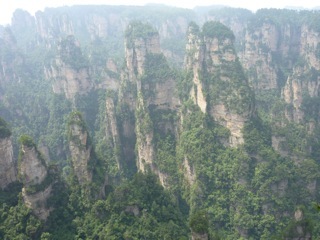 Zhangjiajie is not on the way for typical China round-trips. And it is not equipped to deal with guests like us. In the evening, we try to order a glass of wine in the bar of our five-star hotel, and the waitress says: 没有 (We don’t have that.) Only after we complain to the management she produces four bottles for us to choose from. We rule out the 1200 Yuan Baron de Rothschild Bordeaux and settle for a Chinese Changyu, which turns out to be a nice light red, similar to a Cabernet Franc. The next day, we tell Mr. Peng that we don’t need him anymore. We still have not given up on the idea of hiking. This time, we start our tour with about 4000 other Chinese tourists alongside a little creek. After half an hour, we adventurously take a left turn into the forest. In one instant, we find ourselves hiking up a mountain stairway in complete solitude. The steps are very steep and we cannot drink as fast as we sweat in Hunan’s damp heat – which has the advantage that we never have to use the bathroom. The forest is full of miracles: monkeys and fat toads, butterflies and kiwi trees. When we reach the top after two hours, we are exhausted but happy. 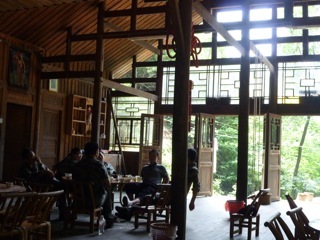 To our surprise, we come across a cozy log cabin with a little restaurant, in which a few locals are playing cards. They are wearing used military uniforms, a common view in China’s rural areas. We buy more water and take a rest, and then we notice the postings that other visitors have left on the wall – in German, English, French, Spanish, Dutch and Czech. “We ran out of water two hours ago”, someone complained. But in the end they all agreed that it was wonderful to have a peaceful day away from the masses. Having left our own message, we hike up a loop trail – and end up opposite the spectacular Avatar rocks. This time, we have them all for ourselves. The views are breathtaking and if you ask me, they even beat the Grand Canyon. The battery of my camera is empty by the time we start to walk downhill. This path too, is not for beginners. We almost get lost twice and we have to climb across two collapsed wooden bridges towards the end. But we managed to get a day with six hours of straight hiking while running into not more than five other travelers. In the evening, we fight to order a glass of whiskey at our hotel bar. After we have persuaded the management to let the intimidated waitress pour us each an ounce of Johnny Walker Black Label, we toast each other on our successful hiking day. 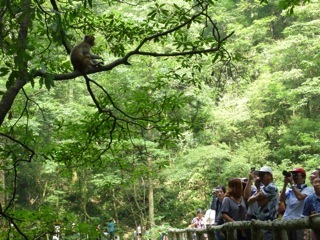 Zhangjiajie is definitely worth a visit – just don’t follow your Chinese tour guide.